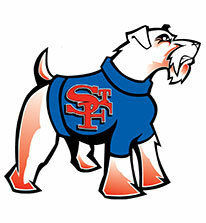 SFP was one of the first high school's in America to offer rugby. SFP Hall of Famer John Barnes was the Prep's first rugby coach and Br. Owen Cappa was the first moderator at the inception in 1966. The Prep soon became a powerful force on the rugby field, beating opponents that included college and local adult men's clubs. By 1969, Prep Rigby was on its first European tour. The Terriers have toured overseas on three separate occasions and have beaten some of the top rugby playing schools in Ireland, England, Scotland, Wales and France. In 1971, SFP beat West Point’s A side, West point has one of the best College rugby teams in the country. Head Football Coach Vincent O' Connor always encouraged his football players to play Spring rugby as the running and tackling skills in both disciplines compliment each other. Rugby was revived at Prep in the Spring of 2013, by Alan Whelan The first season of league play occurred in the Spring of 1024, when current head Coach Cynthia Kouril joined the staff and the program is steadily growing in popularity among today's students. Coach Kouril, , hopes to bring the program back to the lofty status in enjoyed in the 1970's. Today the program is a work in progress which boasts players on both the JV and Varsity Metropolitan Rugby Union All Star teams, Eagle Impact Academy (the source for the USA HS All American Team) and the only high school level Community Olympic Development Program in the US. The Spring 2016 and Spring 2017 league seasons were both winning seasons for Prep. Coach Kouril is a certified Strength & Conditioning Coach, a Level 300 Certified Rugby Coach (the highest certificate available in the USA and the for coaching professional and international rugby teams). Over the past decade, High School rugby has exploded across the country. Here in the Tri State area there are new schools joining the league every season. There are so many schools playing now that the Met Rugby Union has three High school divisions. Though 15 aside league rugby is only played in the Spring, here at Prep we offer Fall rugby skill practice for students who are not playing Fall Sport. A Fall 7 aside league was formed last year and Prep expects to join it this year. We have coached practice twice weekly on Tuesdays and Thursdays with homework fitness work on M-W-F-S. Our Fall program presents students with an opportunity to learn the basic skills of rugby in the off season and intensive fitness training. Football, soccer and other Fall sports players join us once their season ends. A very popular kick off to our winter training season is participation in a Fall 7s tournament on the Saturday of Thanksgiving weekend. It’s great all day campout with family and friends and great rugby playing and great college, adult, and premiership rugby to watch. Today more and more colleges are offering admissions advantages and scholarships assistance for quality high school rugby players. We have alumni playing rugby at every level in college including Division 1, at such schools as Boston College, Hofstra, Malloy College, Stony Brook University, SUNY Cortland, SUNY Oswego, Alfred, Sacred Heart, St. Boneventure, Hampton Heat Collegiate. We are scouted by Columbia, Brown, Buffalo, Notre Dame and other college programs. Students who wish to learn the game now should be cleared by the nurse (sports medical exam form) and must register with RugbyNY.com and be covered by CIPP insurance (included with the registration). 1) Whether or not you are playing a Fall sport, get your sports medical exam form in NOW so I know how many players to expect for Spring. If we have enough players, I may try to schedule some “B” side games, and the schedule gets set in late November / early December, so if I don’t know to expect you, you will get MUCH LESS playing time b/c I won’t have those extra games scheduled. 2) Sign up for CIPP, NOW. You cannot participate in a game or even a contact practice w/o it. And it takes a week or two to process, so have it set, so you can participate in practice right away. To register go to www.rugbyny.org, and click on “register” you are registering to HS Contact. You will need a credit card and you school ID which can be used for both proof of registration in a HS and for picture ID. a week or two later you will be issued an ID card with your CIPP #. If it does not automatically come to your email, you can check it by going to www.usarugby.org and clicking on “member services”. You must print out your card (plain paper is fine) and should put it in your wallet and keep it there to show to referee, if you are ever challenged. 4) Practice in the Fall and Winter is as follows: Coached practice T& Th 3-5 on the field, 5-5:30+ (depending on how much time you waste talking and goofing off) in the weight room or fitness center. M/W/F, uncoached practice led by the seniors which involves a 5 mile run plus body weight exercises. There will be occasional weekend practices. Practice is never cancelled b/c of weather unless the school closes early b/c of weather. Practice in Spring is Coached practice and or games T/W/Th/Sunday. Monday is rest day. Friday is heavy lifting day. Saturday is 5 miles plus stretching and flexibility work to prepare for Sunday. 5) When we are the home team, we are expected to provide a tailgate for both teams to share after the game. 6) We may be ordering old school jerseys replicating the 1976 bicentennial SFP jerseys. We are considering ordering team kit bags (a rugby uniform is called “kit”).